Elo Ozumba looks into the distance. 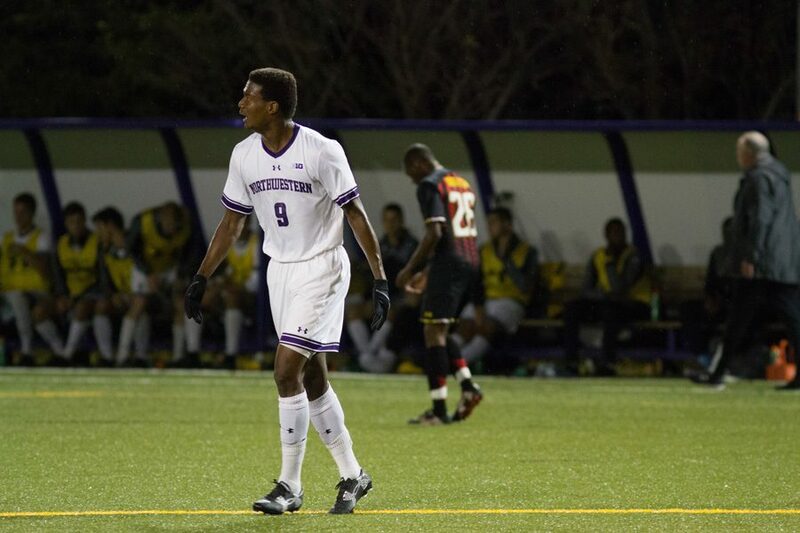 The junior forward failed to register a shot as Northwestern’s offense sputtered in a 4-0 defeat to No. 1 Maryland. Soggy field conditions didn’t slow down No. 1 Maryland’s high octane offense, as the Terrapins cruised to a 4-0 victory over Northwestern on Friday night at Martin Stadium. The Wildcats (2-7-1, 1-3-1 Big Ten) topped Maryland (7-0-2, 4-0-1) in overtime each of the last two seasons and had hoped to get a similar result Friday. But the Terrapins had other plans. “(Maryland has) had this game circled for a long time,” coach Tim Lenahan said. The Terrapins set the tone for the game by striking first in the 11th minute, when Maryland forward Sebastian Elney received a well-placed through ball from fellow forward Gordon Wild. Elney back heeled the ball to midfielder Jake Rozhansky, who buried it from 10 yards out to grab a 1-0 lead. NU was able to hang in the game and keep Maryland from scoring another goal before half, despite playing without the ball for most of the period. When the Cats did get possession, they struggled to sustain pressure, while junior forward Elo Ozumba struggled to break through the Terrapins’ back line. Maryland, which averages 2.67 goals per game, found its offensive stride once again in the 51st minute. Rozhansky unloaded a shot to the left side of the goal, and while junior goalkeeper Francisco Tomasino made a diving save, the ball ricocheted off the left post right to Maryland midfielder Amar Sedjic, who put the ball away to give the Terrapins a 2-0 lead. Although NU’s defense had some success bottling up the Terrapins earlier in the match, it showed some holes after the second score. Wild, Maryland’s top scorer, added another goal in the 61st minute and midfielder George Campbell tacked on another tally in the 80th minute to finish off the scoring. Lenahan said he was more disappointed in his team’s effort than the final score. “Against the No. 1 team in the country, when you give a C+ effort, you get a 4-0 game,” he said. The large margin of defeat is a hit to the Cats’ momentum — they are looking to turn around a season that hasn’t gone according to plan so far. Tomasino said NU has to move forward and prepare for its game in Orlando against UCF on Wednesday. “We’ve got to put this behind us, have a short memory,” Tomasino said.